Guess what? I won! 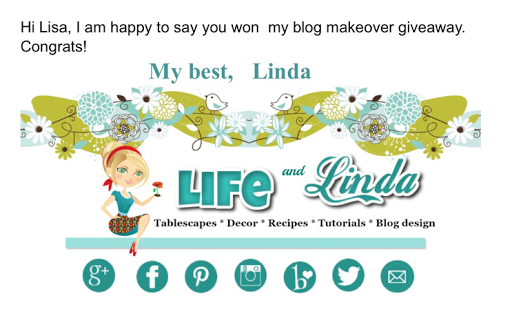 Yes I entered to win a free blog make over at over at life and linda and two days later I got the memo that I had won! I now have a "My Fairy Blogmother". It was about time It got a face lift and I was planning on eventually giving it a redo but there is only so much you can do from Blogger itself. They have some nice templates but I like my own personality to show through mine. Frankly, I was just too lazy to mess with it. Linda contacted me via email and got some ideas of the look I was going for and it took off from there. I even learned a few things along the way. Did she make it look great or what!? Be sure to visit her site and see example of her other blogger designs. My blog is not the only thing that got a new look today. My butterfly bush got a nice trim and decor. 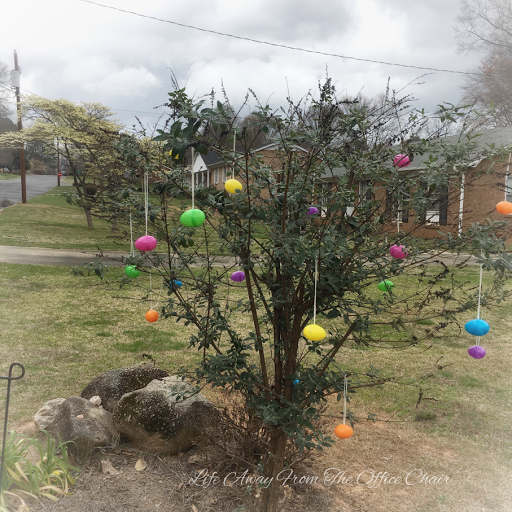 My daughter came for a visit and we made an Easter tree. We also baked cookies. My daughter is an adult and lives out on her own. Living 30 minutes from us, she manages to visit every few weekends. When she comes home, my mommy engine goes full throttle. I fix her meals to eat, we bake, shop, tell stories and laugh a lot.... And yes, I have to throw in those life lectures (maybe to much). No matter how old she gets, I somehow can not let her grow out of those fun childlike traditions we have during the holidays. Hi Lisa, It was my pleasure to give your blog a makeover. Congrats on the win! With your guidance, I gathered enough info about your style and personality. I love your beachy style. I am thrilled you are loving your new look. You not only have a new look, but a very responsive template as well. A custom template that reflects your style. Looks great! I'm contemplating an update for mine to coincide with my move to Florida :-) I'm envious of your palm trees! Lots of things look great today., YOU, the Easter bush and your blog. Sooo I am glad you are happy with it, that is what counts. Good for you! And you GO MOM! The important thing, is you love it, huh. Congratulations, like the new look. It's bright and easy to read. I'm glad you didn't go for the 'read more' kind. Like the new blog look. LOVE your egg tree. NIce indeed.